The average age at diagnosis is around 2 years old, although some children are found to have JMML just days after being born. It is an extremely rare disease with approximately 50 new cases occurring in the United States each year. What are the signs and symptoms of JMML? 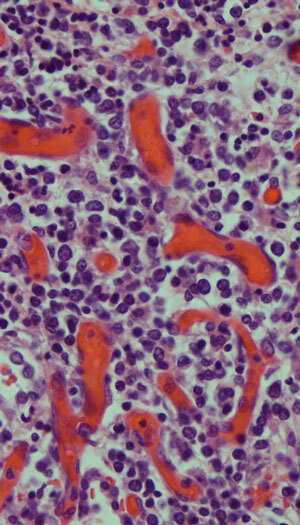 JMML cells seen in lung tissue. Photo via UCSF Department of Pathology. JMML cells can crowd the spleen and liver, leading to swelling of the abdomen. This can put pressure on the stomach and cause children to gain weight more slowly than usual. If leukemia cells enter the lungs, children may have shortness of breath or difficulty breathing. Fever, lack of energy, bleeding and rashes are also common symptoms. The first step is to look at a blood sample under a microscope. All children suspected of having JMML will need a bone marrow biopsy in order to ensure that they do not have another type of leukemia. Certain changes in DNA, also called “mutations,” are found in 90% of children with JMML. Doctors can identify these mutations by reading the letters of DNA inside the leukemia in a process called “DNA sequencing.” This can help them make the diagnosis of JMML. 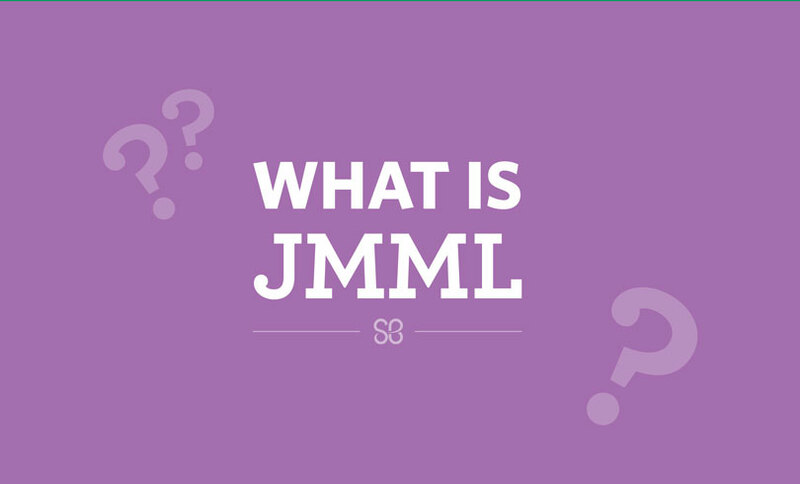 What treatment options are available for patients with JMML? The only curative treatment for JMML is a stem cell transplant. It often takes several months to find a potential donor to provide these cells. Most patients are prescribed chemotherapy while waiting for a transplant. Very rarely, a small percentage of patients with JMML have had their leukemia go into remission without any treatment. Unfortunately, we cannot predict at diagnosis which patients will fall into this category. How is research helping children with JMML? Over the past two decades, researchers have identified several mutations that allow for a more rapid diagnosis. In addition, researchers have shown that nearly 25% of patients with JMML have syndromes that make developing JMML more likely, including neurofibromatosis type 1 (NF1) and CBL syndrome. Research is currently ongoing to develop a test to determine which patients are most likely to benefit from a transplant versus those who would benefit from less intensive treatments. Treatment with a stem cell transplant has also become much safer thanks to advances in clinical research. Still, only about 50% of kids with JMML survive five years beyond diagnosis. For children who have not responded to regular JMML treatments, there is currently a clinical trial in the United States testing an oral medication called trametinib that has shown promise in other types of cancer. Similarly, there is a clinical trial in Europe testing a medication called azacitidine for patients with aggressive JMML.